I am preparing for an exam next week (in an Arthropod evolution course, no less) so I will keep this post short and sweet. In the last week I have had the opportunity to see two very charismatic moths, one as an adult and another as a larva. 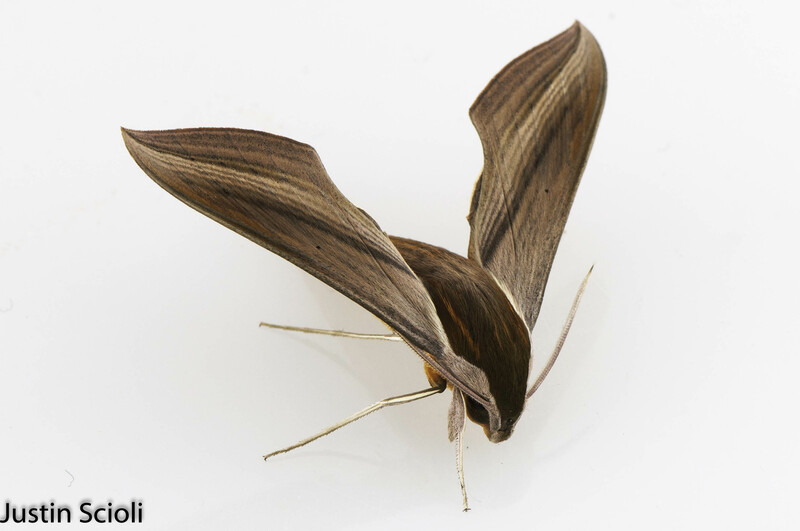 The first is this beautifully colored tersa hawk moth (Xylophanes tersa). 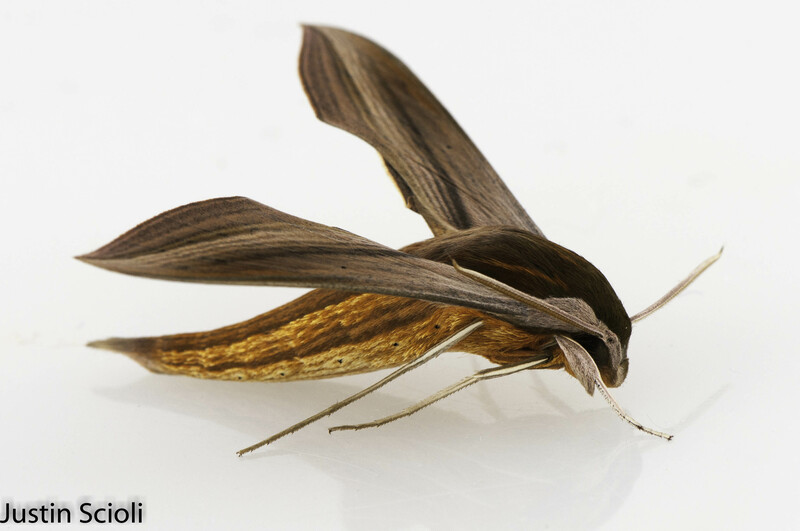 Like many other members of the Sphingidae, this species is a large bodied moth which continues feeding as an adult. When I showed these images to one of my lab mates, he said it evoked the look of a “70’s shag carpet,” and I think that is an excellent way to describe the look of this cool moth. The narrow antennae of this individual make me think it is a female. This species ranges from Canada to Brazil, but this is the first time that I have seen one. The larvae of this species, like its relatives, have a dorsal protuberance on their posterior end, lending them the name “hornworms.” This group includes the important study animal and agricultural pest, Manduca sexta. The second marvelous moth of the week was this caterpillar, which is a larval io moth (Automeris io). This species, in the Saturniidae (like the charismatic and also locally present luna moth, Actias luna) is a variably colored, large and showy moth as an adult with large eyespots on its hindwings. The yellow-green spines that line the body of the larva are in fact venomous, so I had to be very careful while handling this individual. I tried to keep it and raise it, but it died just a few days after collecting it. I was able to give it host plant leaves, which it did eat, but it seemed sluggish when I found it so it may have been on its last legs to begin with. 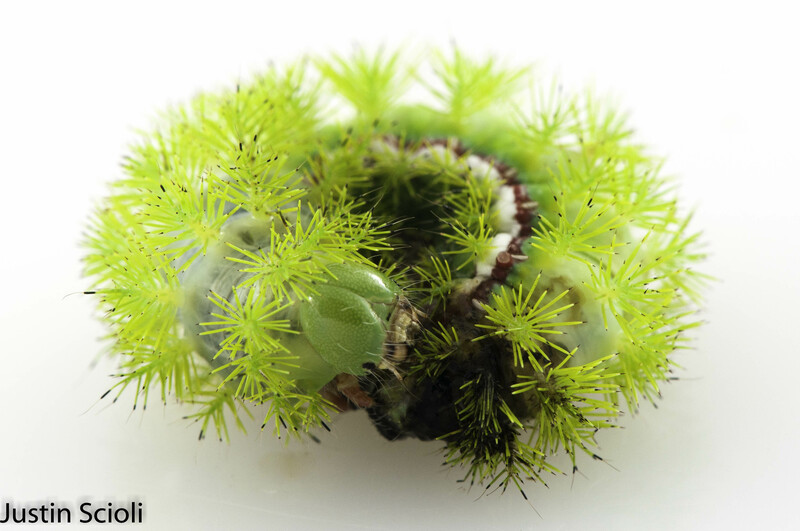 That’s a bit disappointing, as watching an io moth emerge from its pupa would certainly be something to see.